Composer, audio producer, guitarist and vocalist Cornell Hurd has a biting sense of humor that bodes well for country music song writing and for Broken Spoke fans. His “It Wouldn’t be Hell Without You,” and “Your Ex-Husband Sent Me Flowers (‘Cause He Feels Sorry For Me,”) and “Tell Your Shrink I Said ‘Thanks for Nothin’” represent just a few lyrical themes that sting a bit and resonate. Releasing more than a dozen albums in the past 20 years – all of them on the Behemoth label, in 2000 Hurd also produced Johnny Bush’s Lost Highway Saloon. 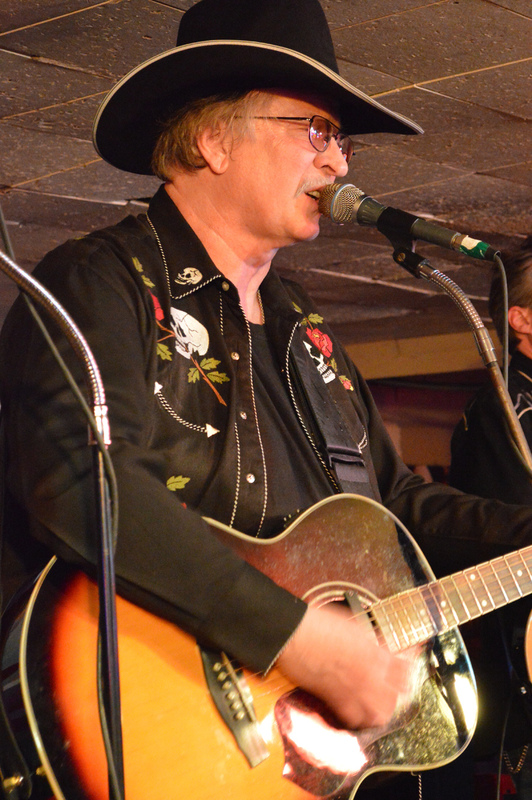 At least one Saturday night a month, Hurd plays the Broken Spoke, a steady gig in town where he and his band packs a crowd on the large dance floor. Hurd claims that he moved to Austin from California for the sole purpose of performing at the Broken Spoke and says he feels sorry for other musicians who have never experienced it. Hurd grew up in Silicon Valley, California the son of ex-military parents. His father worked as an engineer during the Cold War and he served as a pilot in the U.S. Air Force. He once lived in the Cupertino area of Santa Clara County, directly west of San Jose, home to Apple computer company. He grew up with one of Apple’s founders, Steve Wozniak. His friend Wozniak, who attended the same junior high, high school and college as Hurd, mentions him in his last biography as David Hurd, though he goes by his middle name these days. The country music scene in Berkeley, California provided the impetus for Hurd’s musical direction and also inspired another one of his friends, Ray Benson of Asleep at the Wheel. When Benson and Asleep at the Wheel moved to Austin in the early 1970s they visited the Bay Area and tried to convince Hurd to make the move after he graduated with a degree in sociology from the University of California at Berkeley. Eventually, he moved to Austin where folks promised warmer weather and a gig performing at the old Armadillo World Headquarters. He performed the Armadillo nine times, thanks to a little help from his friends, Asleep at the Wheel and Commander Cody & His Lost Planet Airmen. In the late 1980s, long before the Internet, Hurd moved to Florida to work tech jobs. Then one day, by chance he watched Billy Joe Shaver’s video, Way Down Texas Way. Hurd hadn’t yet decided how he was going to get to Texas at that point. He was 40 years old and he had been living with the woman who would become his second wife, Debra. He started talking long distance to his former bass player, Frank Roeber, who lived in Jacksonville, Florida and a former guitar player, Paul Skelton, who lived in New York City.Meanwhile, Hurd’s job in Tampa-St. Petersburg ended. Hurd said all of the country music stars he grew up listening to either hailed from Texas or they performed there regularly throughout their careers. In the 1980s, every bar or lounge in Texas had a dance floor. He said the dancing at the Broken Spoke astounds people when they visit from anywhere from outside Texas or beyond the United States. The Texas dance tradition separates the Broken Spoke from a bar. Hurd mentions in one of the liner notes off one of his 20CDs that watching people dance represents one of the best parts of any gig playing in a dance hall. “What’s not to like about beautiful women dancing by you?” Hurd said. James and Annetta White, still dress up to dance at the Broken Spoke. “They are really good dancers and the Whites obviously love this music,” he said. The Broken Spoke also represents the best part of the local music community as well as statewide. If anyone charted the relationship between music and geography in Texas, Hurd said a push pin map might reveal that the greatest number of music stars come from Texas. Hurd referred to Willie Nelson’s autobiography with Bud Shrake, Heart Worn Memories, about the Red-Headed Stranger’s roots growing up in Abbott and West, Texas. However, Hurd defined the genre of music performed in town, as a genre that cannot be found in such abundance anywhere else on Earth. “Austin’s not the rock capital of the world; not anywhere even close. It’s not the blues’ capital of the world; we haven’t been a blues town in a long, long time. It isn’t the Reggae capital of the world and it isn’t the jazz capital. Classical music? – No. It’s none of those things. What are we the capital of? We are the capital of Ameripolitan music,” Hurd said. Hurd said that Ameripolitan music has roots in country, rockabilly, honky tonk, and Western Swing. He said singers and musicians who do not hail from Texas, often remain connected to the state because out of a love for: George Jones, George Strait, Waylon Jennings and Johnny Bush. On a similar note, he adds that Roger Miller wrote Texas standards and played fiddle for Ray Price’s band in the late 1950s, while Johnny Paycheck played in George Jones’ band. The greatest Nashville musicians have all performed at the Broken Spoke because it has provided the space and money for their work. The album, Live at the Broken Spoke, in 1993, followed a trend begun by a few other local artists who also took advantage of the venue to record their music. The tradition began in 1964 with the Geezinslaw Brothers, a comedy country band fronted by Sammy Allred and Dewayne “Son” Smith until 2005. 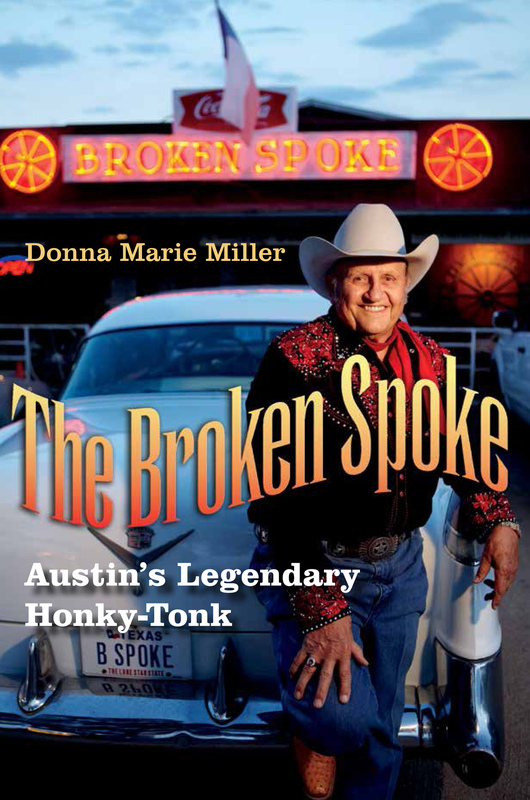 The 1990s represented “a second coming of the glory days” of country music in Austin and celebrity musicians who performed at the Broken Spoke included local headliners: Don Walser, The Derailers, Rosie Flores, Bruce and Charlie Robison, and Junior Brown. People from all over the world still come to hear music at the Broken Spoke, he said. “People come from Japan. People come from Norway – no one goes to Norway to hear their music,” Hurd said. The Broken Spoke represents more than a local business; it draws fans of country music to Austin more than the city itself, he said. When Hurd and his band perform on Saturday nights, they often pack a crowd of world travelers visiting town. Kidding aside, Hurd turns into quite the promoter and marketing specialist whenever he talks about the Broken Spoke. Nostalgic mementos like Joe Baland’s silver saddle that he once wore in the Rose Bowl parades, an original Nudie brand western shirt, autographed guitars, and photographs of celebrities and musicians who once performed at the Broken Spoke have created its magical atmosphere. “There was a time when big band and jazz music was the music of America. That’s where Bob Wills came from. That went all the way to the 60s until we got into playing on top of the beat. Texas is still swinging: it’s swing dancing. Whether you play rockabilly, or you play boogie-woogie or you play Western Swing, this is where it’s done,” he said. Texas music continues to resonate with fans. The Broken Spoke remains as timeless as the music performed here. Hurd lives for those moments on stage when all of the musicians in his band play their instruments independently to produce a unified sound — melodies — that elicit a series of emotions from their audience. Typically, his band includes: Scott Walls, on steel guitar; Chris Cook, on rub board; Nathan “Night Train” Neal, on tenor sax; Jim Starboard, on drums; Allen Crider, on lead guitar; Bracken Hale, on bass; and Basil McJagger, on piano. When he performs Charlie Walker’s song, “Pick Me Up on Your Way Down,” the dance floor stays full the entire time, he said. Hurd said that the musicians who can play music with “that Texas feel” are both a joy to hear and a joy to work with too. The modern day term, “swag” applies to country crooners who possess an air of confidence and casualness on stage. Wills had it and Strait has it. After the 1960s, city dance halls replaced rural barn dances. They had a reputation for drawing stars who played for bigger crowds. Over the past 50 years, places like the Broken Spoke have dwindled across the state. Today its hallowed halls stand as a shrine to country music. Despite the fact that some people think Texas is a beautiful lush garden, it isn’t. Native Texans and those who have lived the longest periods of their lives here realize that the people of this state represent some of its greatest resources. The state’s rough and rocky landscape, remains undaunted by the wind and unpredictable, and at times, harsh weather. “I’m proud to be a Texan. I am,” Hurd said. The only thing he truly finds fault with in this state, might be the weather. The weather may be the only topic Hurd won’t talk about on stage. Like the 1923 book, The Wind, written by Dorothy Scarborough, such talk often stirs up his fury. Only political discussions raise as much dander on a native Texan’s back. Hurd said during his first trip to Amarillo he saw young cowboys in the dance hall dancing with 70-year-old women. Now he’s grown used to seeing similar pairings at the Broken Spoke. Dancing is still considered a rite of passage in Texas; often elder family members teach their younger children how to dance at the Broken Spoke. On any night Tuesday through Saturday, the Broken Spoke serves food as well as alcohol to anyone 21 years or older. Children under the age of 18, when escorted by their parents, may be admitted into the Broken Spoke. Families often bring multiple generations inside to dance. “People sometimes tell me – ‘oh no, I wouldn’t go into the Broken Spoke. That’s a rough place.’ I have been playing here nearly 25 years and I’ve never seen a fight in this joint,” he said. “I feel sorry for the man who would start a fight in Annetta White’s bar. That would not be fun.